The art of Oceania encompasses the artefacts created by the indigenous peoples of a geographic region spanning almost a third of the world’s surface, from Tonga and Tahiti in Polynesia to the scattered islands of Melanesia and Micronesia. Comprising some 20,000 Pacific islands, and close to 1,800 cultures and languages, Oceania is one of the most diverse regions on the planet. The art of Oceania falls into two major categories, corresponding to the years before and after Western contact. The rock paintings and engravings of the Australian Aboriginals, thought to be more than 40,000 years old, are the oldest surviving works of Oceanic art. Today, the market for Oceanic art is primarily concerned with works that were originally conceived for ceremonial use. The artist-makers of Oceanic art are usually unknown, so its market value is greatly influenced by provenance, condition and rarity. What are the key styles and materials new collectors should know about? The sheer scale of Oceania makes stylistic categorisation of its art a complex undertaking: artefacts vary in size and form depending on the islands from which they originate, and their materiality, texture and splendour differ according to function, whether ritualistic or otherwise. It can also be ornately embellished with detailed carving, feathers, beads, or shells. Clay, sperm whale ivory and stone are among the other most commonly employed materials in Oceanic Art. How did the market for Oceanic art develop in the West? The market for Oceanic art was established in the late 18th to early 19th century when the first explorers, traders and missionaries returned to Europe with ethnographic artefacts. These artefacts were initially collected and exhibited as ‘curiosities’ across Europe, and later acquired by museums and private collectors. By the beginning of the 20th century, avant-garde artists and dealers in Berlin and Paris — including Matisse, Picasso, André Derain, Paul Guillaume, Charles Ratton, William Oldman and Guillaume Apollinaire — had become keen collectors of ethnographic objects, regarding them as aesthetic works in their own right. The influence of ethnographic art on their style has become known as Primitivism. In June 2013, a dedicated Oceanic sale at Christie’s in Paris saw a ceremonial roof figure from the Sepik region of Papua New Guinea (pre 1890) realise €2.5 million, more than twice its high estimate. More recently, in 2017, the Vérité Collection achieved €16.7 million at Christie’s Paris — the highest performing single-owner sale in Paris in a decade. The Hawaiian god statue shown below was the highlight lot of that sale, realising €6.3 million — a world record for the most expensive Oceanic art object sold at auction. Another highlight, a very rare black Uli statue from New Ireland, sold for circa €2.9 million. According to Teodorescu, this recent rise in the market can be attributed to four primary factors: the rarity of pieces in exceptional condition to market; the availability of documentary provenance; a widening trend for cross-category collecting; and a growing enthusiasm among both public institutions and private collectors to re-evaluate the overlooked. Teodorescu states that Polynesian art — covering 1,000 islands, including New Zealand, Easter Island, the Cook Islands, Fiji, Marquesas Islands, Tonga and Hawaii — is currently the most in-demand type of Oceanic art. Among its first European collectors were Captain James Cook and the artists and scientists aboard the HMS Endeavour, which set sail for Australia and New Zealand in 1768. The connection between Polynesian art and the earliest discovery voyages of the South Pacific Ocean ‘make it the oldest and the most historically rich style of Oceanic art on the market’, says the specialist. ‘It’s also the rarest.’ This is because much Oceanic art was destroyed in the early 19th century as traditional cultures embraced Christianity. ‘And most of what has survived is now housed in public collections,’ adds the specialist. Among the most coveted Polynesian artefacts are Easter Island artefacts, Cook Island God staffs and Maori ornaments from New Zealand — sculptural wood carvings, such as bowls, statues and clubs; objects associated with oceanic travel, including paddles and canoe prows; or any ceremonial object of artistic and cultural relevance. The very rare Nukuoro figures, produced by the people of Nukuoro Atoll, a Polynesian enclave in Micronesia, are likely to also be at the top of any collector's list of Polynesian art. Polynesia is mostly known for its giant Easter Island stone Moai. Smaller wooden Easter Island sculptures, carved to honour ancestors, are very popular among collectors because they ‘symbolise one of the most emblematic Polynesian societies’, says Teodorescu. Melanesian art covers Vanuatu, the Solomon Islands, the Torres Strait, New Caledonia and Papua New Guinea, and is today the second most highly coveted style of Oceanic art among serious collectors. Its decorative detailing served as a great source of inspiration for many 20th-century Surrealist artists, including Roland Tual, Wilfredo Lam and Max Ernst, as well as Surrealist poets, including Paul Eluard, Tristan Tzara and André Breton. In 1948 Breton, who assembled a considerable collection of Polynesian and Melanesian art, even dedicated a poem to his 4ft-high wooden Uli ancestor figure — like the one pictured above — from New Ireland (a province within Papua New Guinea), claiming that it inspired his ‘art magique’. 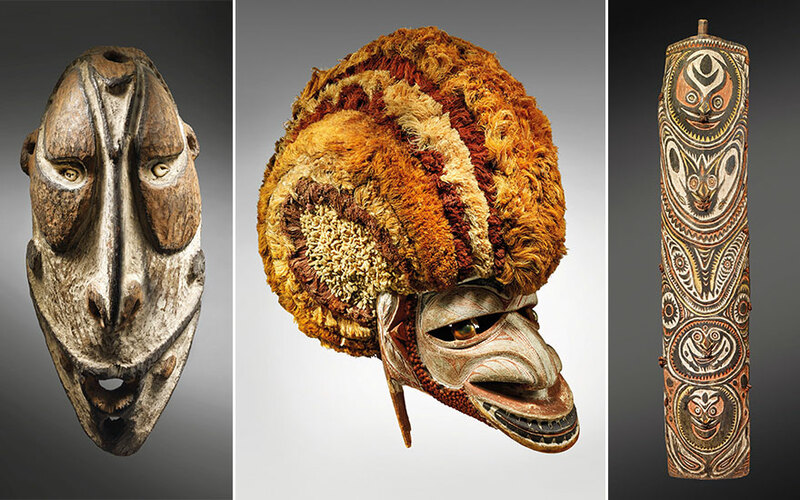 Masks from the region around the Sepik River in New Guinea, dating to the late 19th century, are among the most sought-after objects from Melanesia. The ceremonial wooden malangan from New Ireland — decorative ornaments or figures intricately carved for the cycle of funeral rituals — are also very popular. Principally concerned with honouring and dismissing the souls of a specific individual, malangan carvings were usually destroyed, allowed to rot, or sold after service. In contrast to the intricately carved malangan from the north of New Ireland, Uli ancestor figures from central New Ireland are less ornate. Hermaphroditic in form and believed to be imbued with the spiritual powers of the deceased leader, they were traditionally kept in ritual houses and paraded during lengthy fertility, initiation, or funerary rites. What should collectors be aware of? A large proportion of the Oceanic art brought back to Europe by explorers is well documented in public archives. ‘These traceable histories inspire many people to collect, as well as helping new collectors to understand what is old and what is new,’ explains Teodorescu. But Oceanic art is relatively scarce to market, so new collectors are advised to research, visit exhibitions and train themselves to recognise the multitude of different styles. Where can new collectors go to learn more? The British Museum and the University of Cambridge Museum of Archaeology and Anthropology have superb collections of Oceanic art, as do the Musée du Quai Branly Jacques Chirac in Paris, The Ethnological Museum of Berlin, The Tropen Museum in Amsterdam, The MET in New York and The Museum of New Zealand Te Papa Tongarewa in New Zealand, to name only a few. Keeping an eye out for major travelling retrospectives of Oceanic art — including the Musée du quai Branly Jacques Chirac’s Sepik: Arts in Papua New Guinea, 2015-2016, and the Royal Academy of Art’s Oceania, which is now on display in the Musée du quai Branly — is another good way to develop your knowledge.